In the introduction to this blog I made a mention of including recipes. Well, it just so happens that tonight I made one of my favourite recipes, and I thought it might be time to share that and some of the other staples from my kitchen. Since I started making fresh pasta I have pretty much given up using dried stuff. I will buy fresh pasta sheets for making my quick cannelloni, but if I make Bolognese I make the pasta from scratch. Fresh pasta made with duck eggs is even better. First make your pasta dough. Sift the flour into a mixing bowl, make a well in the centre and crack an egg into it. Mix with a fork until the egg starts to take up some of the flour, then add the other egg. 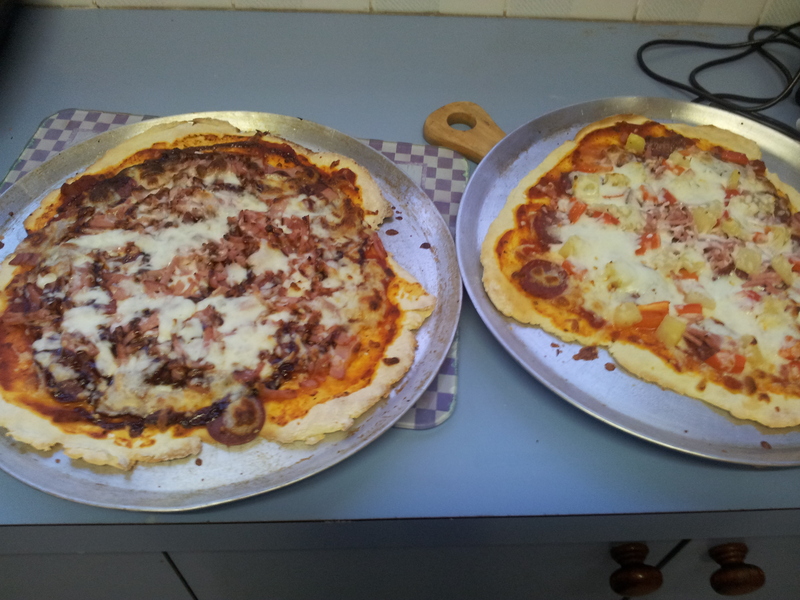 Gradually add flour from the edges until you can make it into a soft dough with your hands. There will be some flour left over, you can use this later. Wrap dough in plastic wrap and put it in the fridge until it is cold. About half an hour is usually enough. Put all the filling ingredients into a food chopper of some sort and blend until you get a fairly smooth taste. You might want to experiment a little with quantities to get a taste that suits you. I like the salmon flavour to feature but not overpower the cheese. Get your pasta dough out of the fridge and knead some of the leftover flour into it until you get a smooth dough that is not sticky. 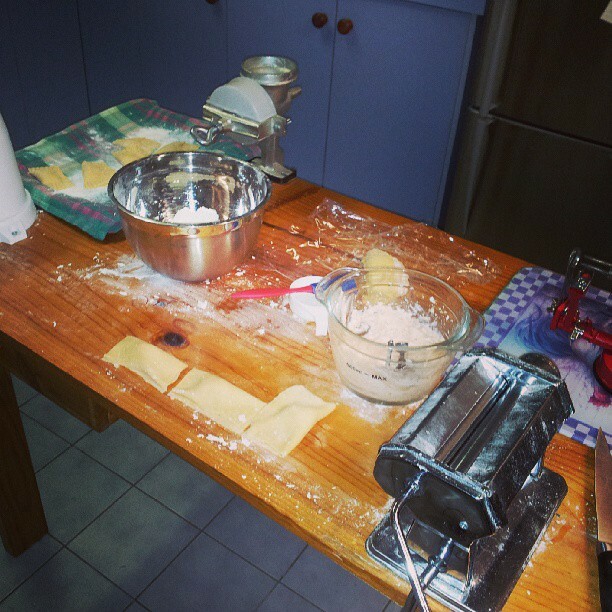 Run the dough through the pasta machine a few times, folding it in half, until it is smooth and a decent shape. Then work down through the thicknesses until you have thin pasta sheets. Dough is easier to work with if done in smaller lots, so you might want to cut the dough in half and roll it out half at a time. Put teaspoons of filling onto the pasta sheets, brush water along one long edge and between piles of filling. 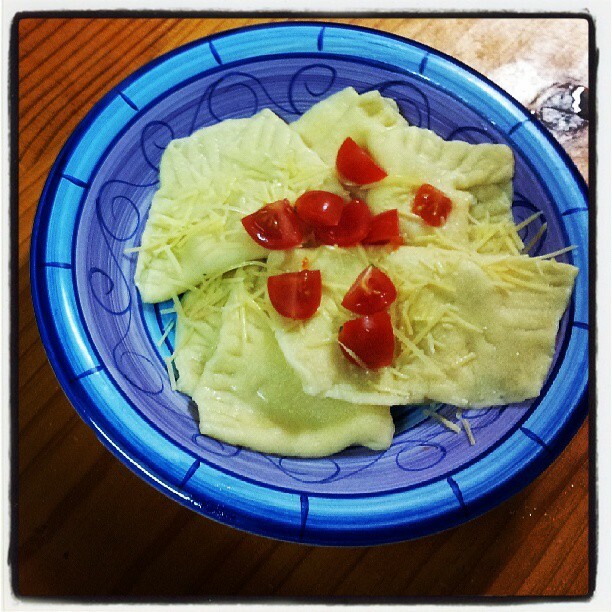 Fold the pasta over, cut into individual parcels and use a fork to seal the edges of the ravioli. Put each parcel onto a floured surface (I use a tea towel on a baking tray), and when all of them are ready put them into the boiling water. Return to the boil, cook for a minute or two (cooking fresh pasta is very quick), and remove with a slotted spoon. Top with parmesan cheese and chopped cherry tomatoes. *Smoked salmon can be replaced with baked or smoked trout. *Chevre can be replaced with ordinary cream cheese. Another thing I make very regularly is iced tea. It is not like the stuff you get in the shops, in that it is made from real tea and is not as sweet, but if you like Nestea or LiptonIce you will probably like the home-made style. 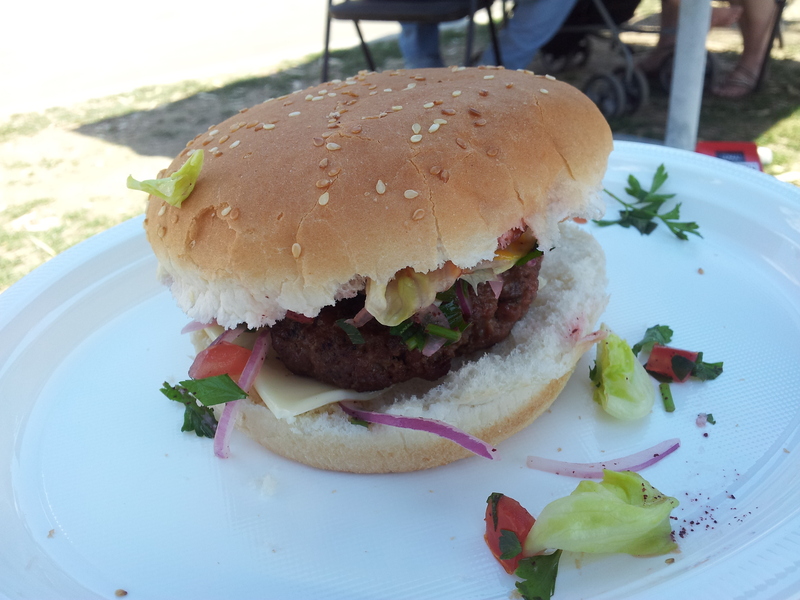 It is really easy and great to have in the fridge through summer. I use a 4-cup teapot and make a very strong tea. For black tea I use 3-4 teabags, infused for about 5 minutes. I use 1.5lt glass bottles, but you can also use glass jugs. In each bottle I put 1tbsp of sugar or 3 teaspoons of fructose powder. Then I add the juice of half a lime or lemon. You can use lime juice cordial instead of sugar and freshly squeezed citrus juice. Remove the teabags from the tea and pour half of the tea into each bottle or jug. Swish it around until the sugar dissolves and top up with cold water. You can serve it with citrus slices, try using green or white tea instead of black, use raspberry juice instead of lemon or lime or add Manuka honey. Play around with it and find your new favourite. You may want to make it sweeter to start with, but you should get to a point where the flavour is more important than the sweetness. My kids never go to school without something home-baked in their lunch box. I usually make a batch of muffins and freeze them, then the boys just need to grab one out of the freezer, put it in a container and playlunch is ready to go. I have a basic muffin recipe which I can alter, from blueberry to double choc. Choc-chip cookie is my favourite flavour. 90g butter, melted. Butter, not margarine – very important! Butter gives a much better flavour to baking. Mix flour, sugar and chocolate in a bowl. Add milk, egg, vanilla and melted butter and mix until just combined. Spoon into patty cases or muffin trays. I use patty cases in a muffin tray. Bake at 180 degrees for about 15 minutes, until muffins are slightly golden on top. Makes 12 small-ish muffins, but you could make less bigger ones. These might need to cook for a bit longer. So that is just a few of my more popular recipes. Other things I make a lot include pumpkin soup, carrot and bacon soup, pea and ham soup – I might have to do a soup post down the track. I have a few types of bread and rolls that I really like. Oh, and a couple of ice-cream recipes that the boys all go mad for, as well as healthy options for an icy treat. My kitchen is my happy place, a night or afternoon of cooking, with my iPod on and a cider or two, is something I really enjoy. So I have a bit on my plate, what with all that saving the world and empowering women to be done. But first, let me talk about goats. There is a lot of misinformation about goats. That they eat everything, that they smell, that their milk tastes nasty. Some people think that they are wary of humans, like sheep tend to be. Many visitors to my place are surprised when my goats come up complete strangers looking for cuddles. Very few are prepared for the level of intelligence that goats display. Goats do not eat everything. There have been times when I have wished I could get one of my goats to eat at all. Many times when their dinner has been sniffed at suspiciously and left untouched for no discernible reason. They will make a mess of your fruit trees, roses, jasmine, herbs or vegetable crops. Some of mine will nibble on your clothing as a means of getting attention. As browsers, they will try pretty much anything green and if they like it they will keep eating it. Due to the high nutrient requirements of breeding or milking goats they cannot be sustained on grass alone and will eat more slow-growing, nutrient-dense plants when they can get to them. They love soft young trees. 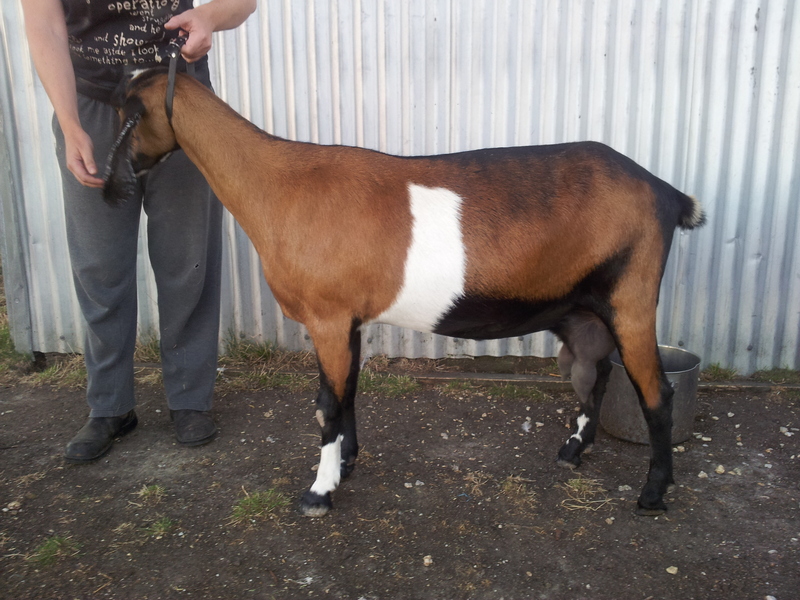 Billy goats do indeed stink very badly in the breeding season. This is not ideal when they also want scratches and pats. But does hardly smell at all. As for the milk, goat milk is the most consumed milk in the world. It is different to cows milk, and tastes much better fresh and raw than from a carton. I find that fresh goat milk is sweeter and richer than cow milk from a carton. In summer I find few things more refreshing than a big glass of cold goat milk. Goat milk is a superfood. Sometimes referred to as ‘universal donor’, it can be used to feed baby mammals of almost any species. It is better for you than cow milk, and is less likely to cause adverse reactions. So if it tastes ‘different’ to the heat treated, homogenised milk you are used to, bear in mind how much better it is for you. Especially raw, with all those beneficial bacteria and enzymes. Just being around goats has been shown to reduce skin allergies and even asthma. In the quest for a more sustainable existence, the milking goat is a great ally. She can convert forage into a versatile protein source. She produces an ideal amount of milk for a household. She is also a very lovable family member. 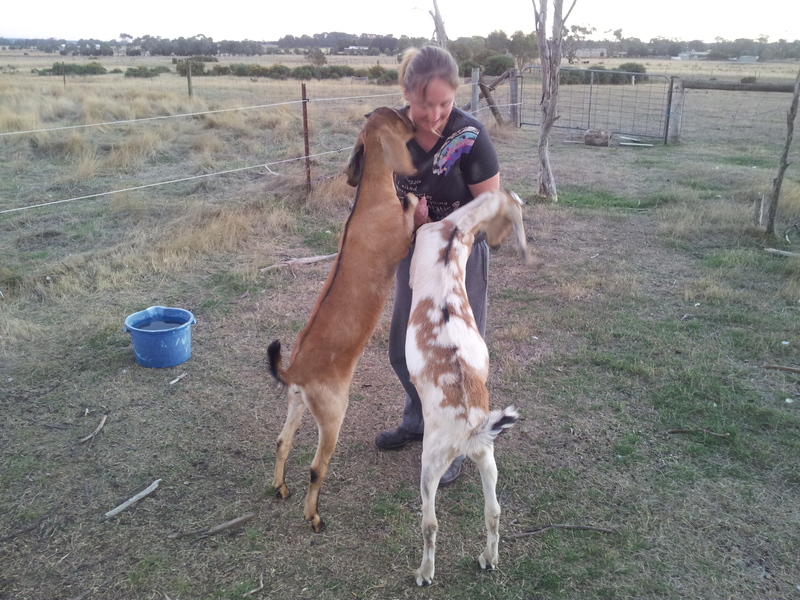 Anyone who has spends a bit of time with goats soon realises how good they are for the soul. And anyone who regards goats with contempt will find them impossible to deal with. I have spent hours in the barn or in the farmyard with my goats. With four or five of them all clamouring for scratches at the same time. With bottle-raised kids in my lap, chewing my hair or climbing on my back. Attempting to get jobs done in the farmyard or paddocks with a mob of helpers demanding attention, getting in the way or knocking things over. During the high-stress kidding season ‘just popping out to the barn’ to check does close to kidding or their delicate newborns can turn into a 45 minute odyssey of watching kids play or comforting over-ripe does. As you become a ‘goat person’ you realise that the real value in them is in their character. They are complex people. Some are easygoing, others frustratingly determined. On the whole, I find the bucks much less bossy than the does. The buck hierarchy is a simple one, based on size, age, and seniority. With the does, it is much more complex. My ‘alpha’ doe is a tiny, delicate, but rather fierce girl. She has also been here the longest. She has stood up to much bigger does. Her daughter never challenges her, and her grandchildren know that being in Grandma’s favour gets you a good spot at the feeder, even if you are just as likely as anyone else to get headbutted by her. Elcarim Sienna, my best milker. 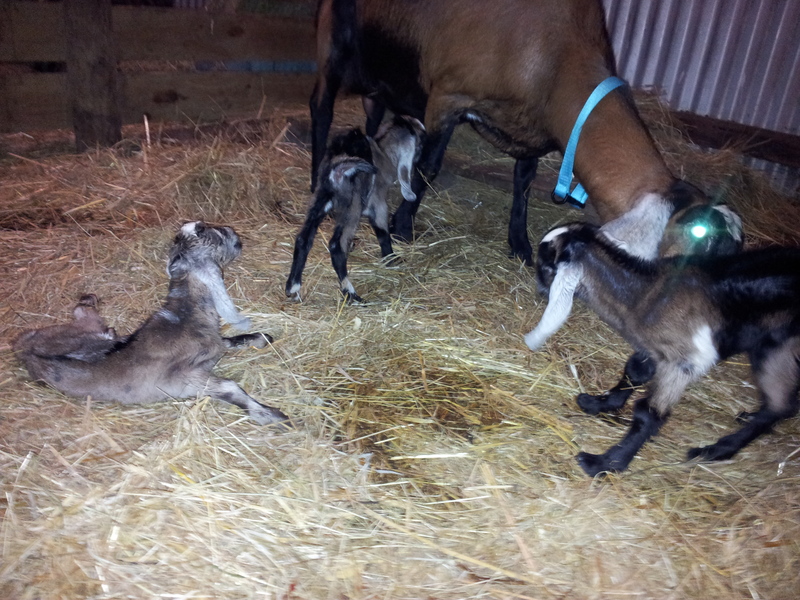 Rianna with her 2012 triplets, Venus, Kevin and Bacchus. They are all very different in personality, as diverse as us humans. From non-confrontational Sienna, a somewhat sensitive, short fat lady who doesn’t expend any more energy than necessary, to the slightly ditzy and very glamorous Meredith with her slender neck, long ears, and even longer legs. From the sad poet Jupiter who cries forlornly (and loudly, and at length) to his lost loves on the other side of the property, to gutsy little Ambika, who doesn’t let being the smallest and youngest doe or being a ring-in from another farm mean that anyone can push her around. Ambika and Thumper, bottle-fed kids. My goats are part of my family. From kidding, which can start as early as the end of June, through the spring shows and into the summer when the kids have been weaned, necessitating twice-daily milking, they are a huge part of my daily life. Whether they are pointedly positioning themself so that my hand rests on their head, calling out from the barn for more hay so that they don’t have to go out grazing in bad weather, or loudly announcing their willingness to breed, they are constantly demanding my attention. The farm can never be unattended, even in the quiet time between drying-off and kidding, when keeping up the hay and grain to rapidly-expanding bellies is crucial. I love my little herd, and I am incredibly proud of them. They are a lot of work, but I could not imagine life without them. I know that tragedies are inevitable, but I hope the rewards will be worth it. And now, with the support of my goats, I will get back to saving the world. PS With kidding to start in three weeks, and my plans to exhibit at the Royal Melbourne Show this year, expect to hear more about my floppy-eared crew in the next few months.